• Megillat Taanit. Considered by some to be the earliest work of “rabbinic” literature, Megillat Taanit comprises a list of dates on which it is forbidden to fast or to deliver a eulogy, written in Aramaic. The entire text can be viewed online here. 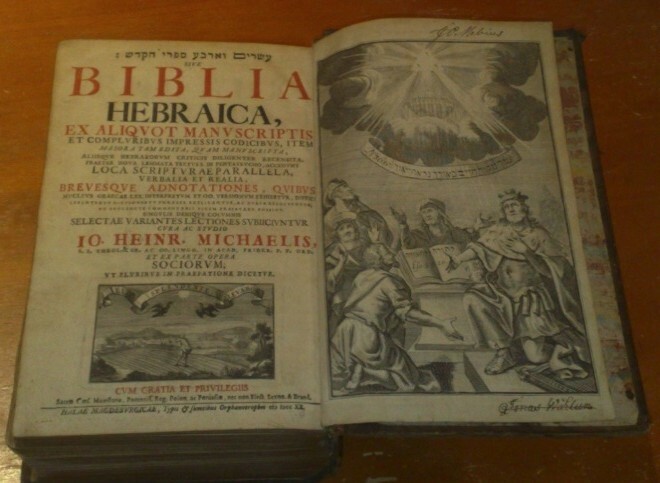 It also includes a Hebrew commentary, which may have been written several centuries later, providing historical reasons behind each of the dates in the Aramaic text. The Aramaic component was probably authored at some stage in the 1st century CE, being referred to in the Mishna (Taanit 2:8), and at least one baraita (Shabbat 13b). 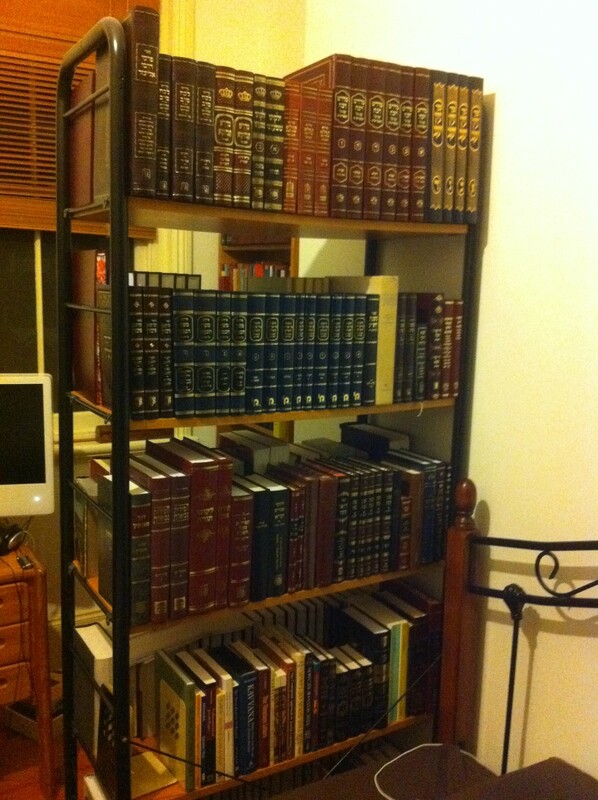 Mine is the critical edition, מגילת תענית: הנוסחים, פשרם, תולדותיהם בצירוף מהדורה ביקורתית, by Vered Noam (Yad Ben-Zvi: Jerusalem, 2003). • HeArukh al-haShas (3 vols. ), by R’ Natan ben Yechiel of Rome (1035-1106). Completed in 1101, the Arukh constitutes the first ever dictionary of the Babylonian Talmud. According to a poem that the author wrote by way of an introduction, it appears that he had four sons: Yechiel, his firstborn, died after thirty days, Benjamin lived only to the age of eight, Shabbetai died at the age of three, and the fourth did not survive long enough to be circumcised. Seeking comfort for his grief in an intensive study of the rabbinic literature, R’ Natan produced a work of scholarship that had a profound influence on subsequent generations of Talmudic scholars, and one that sheds light today on the early history of Talmudic interpretation in Europe. • Sefer Hasidim, by R’ Yehuda heHasid (1140-1217). As one of the leaders of the pietistic movement known as Hasidei Ashkenaz, which flourished in Germany during the 12th-13th centuries, R’ Yehuda has had his name attached to this text but without any certainty as to its actual provenance. A collection of ethical maxims, although not homogeneous in nature, it is believed to have reached its final form in Germany in the early part of the 13th century. • Beit haBechirah (7 vols. ), by R’ Menachem Meiri (1249-c.1306). Although this commentary on the Talmud wasn’t published until the 18th century, and had a very limited influence upon the development of the halakha as a result, it is widely regarded as one of the most lucid overviews of Talmudic law. One area in particular in which it has had some effect is in the author’s emphasis on non-Jews of his day (specifically Muslims and Christians, but also other peoples whose nations are run in accordance with law) falling beyond the purview of those to whom the Talmudic authors were often referring when they spoke of goyim, nochrim and akum. As such, R’ Meiri was likely the first person to observe that certain passages need to be viewed within the context of their Sassanid-era composition. 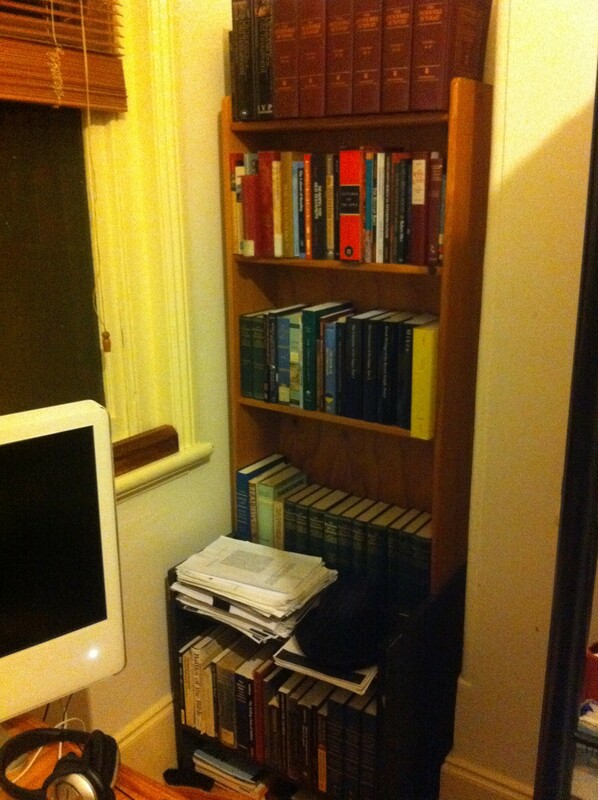 – Aseret Hilulim: the third and final division of the text, this section comprises ten ethical treatises. Although Shnei Luchot haBrit was written expressly for R’ Yeshayahu Horowitz’s children, it has had a profound impact upon the development of subsequent Jewish ethics and philosophy. One area in which it has had a particularly powerful impact is that of hasidic Judaism. The classic Liqqutei Amarim (“Tanya”) of R’ Schneur Zalman of Liady – the principle expression of the kabbalistic philosophy of Chabad – is heavily indebted to this text, perhaps more than any other post-Talmudic expression of ethical philosophy. • HaMeor haGadol (2 vols. ): a compilation of novellae taken from various sources, all of them attributed to R’ Eliyahu ben Shlomo Zalman, the Vilna Gaon (1720-1797), published in 2004. Novellae concern selections taken from the individual parshiyot of the Torah, (most of) the subsequent books of the Tanakh, the sixty-three tractates of the Mishna, the Pesach haggadah and the siddur. – Tzefichat haDevash (first published 1887) is a collection of drashot that had been delivered by R’ Eybeschütz on various shabbatot and yamim tovim. – Seder Tannaim veAmoraim. This 778-page text constitutes a comprehensive index of every sage mentioned in the Mishna and Gemara, together with some brief biographical information (chiefly parentage, tutelage and names of disciples). The index also includes references to every passage within the Mishna in which they are mentioned, as well as to sources within the two Talmuds and their respective commentaries in which the biographical information that he provides can be found. – Shaar III:3; for more on this subject, see Allan Nadlar, The Faith of the Mithnagdim: Rabbinic Responses to Hasidic Rapture (Baltimore, 1999), 11-28. On p16, Nadlar notes that, contrary to Chabad sources, “there was virtually no substantive theological difference between Hasidim and Mithnagdim in their respective theoretical understandings of the nature of divine immanence”. • Mei haShiloach (2 vols. ), by R’ Mordekhai Yosef Leiner (1839-1854), student of R’ Simcha Bunim of Peshischa and the Kotzker Rebbe, R’ Menachem Mendel Morgensztern. First published in 1860 (תר”כ), approximately six years after his death, Mei haShiloach comprises two distinct hasidic commentaries on the Torah. • Minchat Chinukh (3 vols. 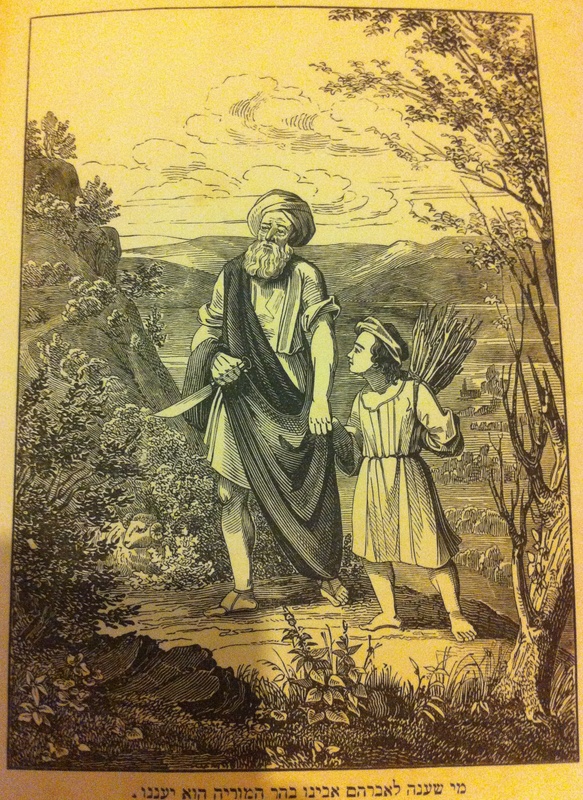 ), by R’ Yosef ben Moshe Babad (1801-1874). First published in 1869, Minchat Chinukh is the author’s conceptual commentary to the 13th century Sefer haChinukh, itself a methodological presentation of the 613 mitzvot, according to their presentation in the Rambam’s Sefer haMitzvot, and arranged by parsha. This 19th century commentary provides depth to those halakhot, teasing out the nature of the legislation by means of reference to Talmudic and post-Talmudic discussions on the subject, and through the author’s own discussion of hypothetical cases. – Chatam Sofer al-haTorah (5 vols). This is a collection of the Chatam Sofer’s previously unpublished novellae on Torah, first printed in 1961 by R’ Yosef Naftali Stern, the son-in-law of the Chatam Sofer’s grandson, R’ Shlomo Aleksandri Schreiber. • Ketav Sofer (2 vols. ), by R’ Shmuel Binyamin Schreiber (1815-1871), the eldest son of the Chatam Sofer. 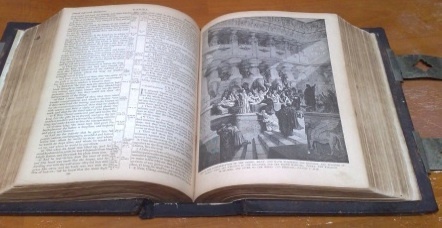 First published in 1883, this is a collection of the Ketav Sofer’s novellae on the Torah, the five megillot, the individual chaggim and the haggadah. • Ha’Ameq Davar (6 vols. ), by R’ Naftali Tzvi Yehuda Berlin (1816-1893), rosh yeshiva at Volozhin. First published in 1879, Ha’Ameq Davar constitutes a commentary upon the Torah (at times, a super-commentary upon Rashi) and upon Song of Songs. • Meshekh Chokhmah (4 vols. ), by R’ Meir Simcha of Dvinsk (“Or Somayach”; 1843-1926). In three volumes (the fourth constituting a series of detailed indices), this is the Or Somayach’s celebrated commentary on the Torah, first published posthumously. Perhaps the most (in)famous component is a remark made in the author’s explication of Parshat Bechukotai, to the effect that certain of his contemporaries were responsible for neglecting the study of Jewish literature, of failing to master the Hebrew/Aramaic language, of ceasing to consider themselves in exile and of considering Berlin to be the new Jerusalem. To such people, R’ Meir Simcha promises a storm of tremendous ferocity, the likes of which this exile has never seen, which will transport Jews to a foreign land in which they will be subjected to harsh decrees, will be reminded that they are Jews and will be brought to the edge of annihilation. – Chiddushei Maran haGriz haLevi: a collection of novellae and drashot on Tanakh and on various passages in the rabbinic literature, attributed to R’ Yitzhak Ze’ev Soloveitchik (“the Brisker Rov”, 1886-1959), grandson of the Beis haLevi. As with the previous collection, these have all been recorded by individuals who heard them from him personally or who heard them in his name. They were first published in 1996. 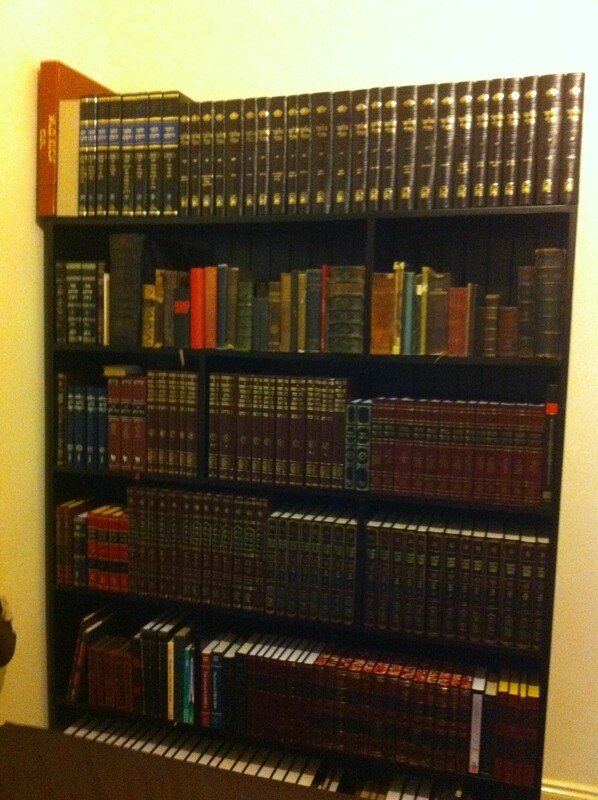 • Tzafnat Pa’aneach al-haTorah (3 vols. ), by R’ Yosef Rosen of Rogatchov (1858-1936). Known as the Rogatchover Gaon, R’ Yosef Rosen (together with R’ Meir Simcha of Dvinsk) was one of very few people to have recognised the infamous Yerushalmi Qodshim as a forgery. A Kapuster hasid, the Rogatchover studied under the Beis haLevi and R’ Yehoshua Leib Diskin (“Maharil Diskin”), and gave semikha to the seventh rebbe of Lubavitch, R’ Menachem Mendel Schneersohn. At the time of his death in 1936, most of his voluminous writings were unpublished, and there were few who were capable of deciphering his famously laconic style. Leaving her home in Petach Tikva, the Rogatchover’s daughter, Rachel Citron, travelled to Dvinsk and met up with her father’s student, R’ Yisrael Alter Safern-Fuchs. Togther, they frantically prepared the Rogatchover’s writings for publication until such time as the Nazi ban of Jewish printing put an end to their efforts. In the time that they had left, they photographed the pages of his Rambam and Shas, together with his copious marginalia, and sent the pictures by post to R’ Tzvi Hirsch Safern in NYC. They were both murdered in 1942, but it is thanks to their efforts that many of the Rogatchover’s writings have now been published. 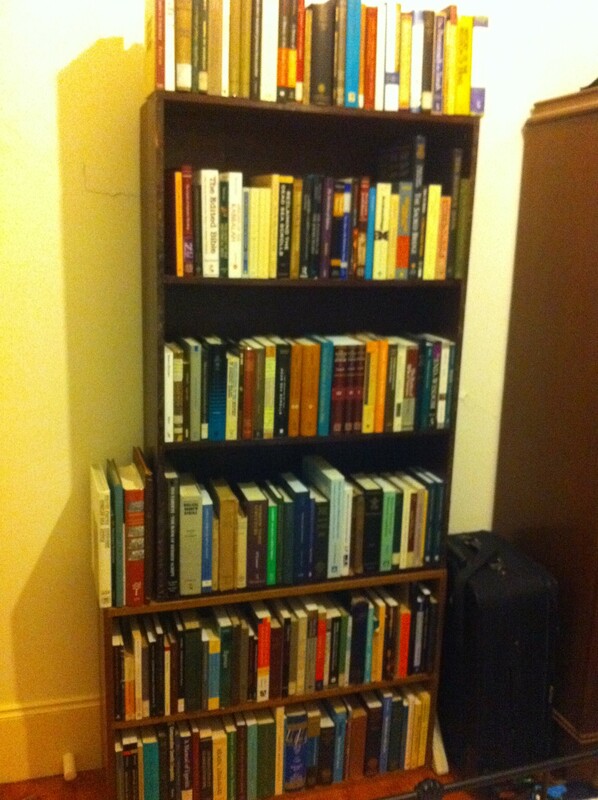 This three-volume set is a commentary upon the Torah and upon the Rambam’s Guide of the Perplexed. It was first published in 1974 by R’ Menachem Kasher, together with introductions that pertain to the life and thought of R’ Yosef Rosen. If you wish to read more about this incredible man, his insights into Torah and the amazing self-sacrifice of those who worked at disseminating them (or if you wish to contribute in any way to the ongoing labour of preparing his manuscripts for publication), you can consult the Tzafnat Pane’ach Institute. • Mikhtav meEliyahu (5 vols. ), by R’ Eliyahu Eliezer Dessler (1892-1953), mashgiach ruchani at Ponevezh Yeshiva in Bnei Brak. Published between 1955 (תשט”ו) and 1997 (תשנ”ז), Mikhtav meEliyahu is a collection of R’ Dessler’s ethical writings, personal correspondence and mussar schmuessen, primarily dealing with themes that touch upon matters of faith, divine providence and free-will. • Sefat Emet (5 vols. ), by the second Gerrer Rebbe, R’ Yehuda Aryeh Leib Alter (1847-1905). First published in 1905 (תרס”ה), immediately after the rebbe’s death, Sefat Emet constitutes a hasidic commentary on the Torah, widely regarded as exceptionally complex by virtue of its offering the reader very little in the way of any indication as to precisely which subject is under discussion, or which passage (in the Torah, in Rashi’s commentary or in the Talmud) is being specifically referred to. • Yismach Yisrael, by the second Alexanderer Rebbe, R’ Yerachmiel Yisroel Yitzhak Danziger (1853-1910). First published in 1911/2 (תרע”א), Yismach Yisrael is a hasidic commentary on the Torah. • Tiferet Shmuel, by the third Alexanderer Rebbe, R’ Shmuel Tzvi Danziger (1860-1923), the brother of his predecessor. First published in 1925 (תרפ”ה), Tiferet Shmuel is a hasidic commentary on the Torah, and one that makes reference in a number of instances to the Yismach Yisrael. • Divrei Yoel (8 vols. ), by the first Satmarer Rebbe, R’ Yoel Teitelbaum (1887-1979). First published in 1971/2 (תשל”א), Divrei Yoel constitutes the Satmar Rebbe’s commentary on the Torah, and probably the most systematic elucidation of his hasidic thought. • Melekhet haMishkan veKheilav, by R’ Asher David Meyers. Published in 2004, this text (“The Construction of the Mishkan and Its Vessels”) constitutes a detailed study of the sanctuary and its adornments, the altars, the table and the courtyard, and the means by which these were constructed. It is based upon discussions of the subject in the rabbinic literature, and includes responsa by R’ Chaim Kanievsky (born 1928), son of R’ Yaakov Yisrael Kanievsky, “the Steipler Gaon”. • Sha’arei Sefarim ‘Ivrim, by A.M. Haberman. Published in 1969 by the Museum of Printing Art in Safed (מוזיאון לאומנות הדפוס, צפת), this work is a collection of images of 104 different Hebrew title pages over the course of several centuries. 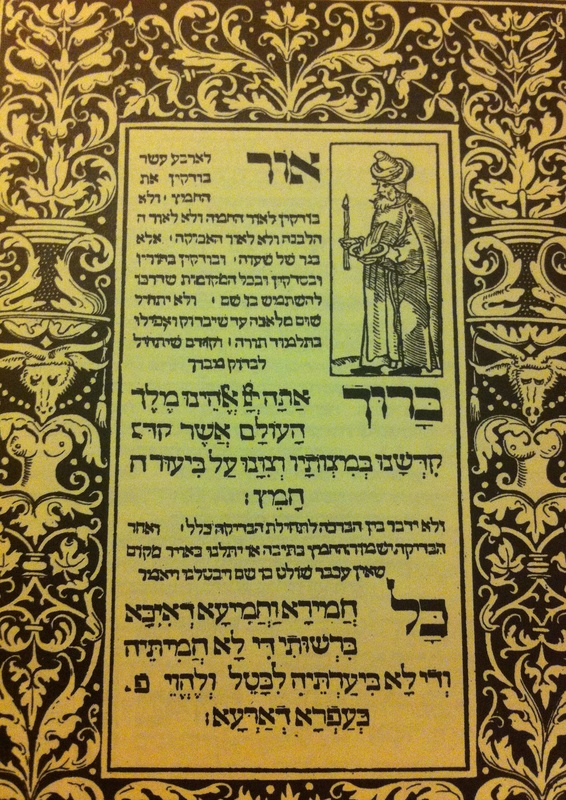 Commencing with a hand-drawn title page from a Tanakh written at the end of the 13th century, and culminating with a printed title page from a 1949 printing of Maayan Tahor (by R’ Moshe Teitelbaum, rav of Ujhely; 1759-1841), it is fascinating to see the evolution of different styles. 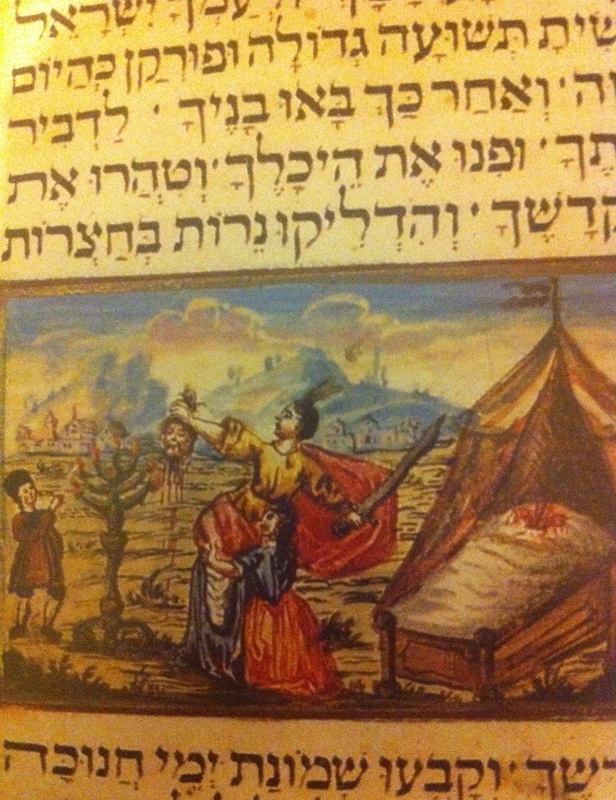 Some are quite startling: a Pentateuch printed in 1591 shows a bare-breasted woman, draped in a cloth and sporting a crown, with a spear in her hand, pointing downwards at a seven-headed dragon; a collection of halakhic novellae on tractates Beitza, Bava Metzia, Ketubot, Hullin and Gittin, printed in 1737, depicts a ship at sea under attack from a giant, hornéd sea-monster, which appears to be swallowing the anchor and which has two men in its belly, wearing pointed hats and lighting a fire beneath a cauldron. The title pages of my own books are staggeringly boring to me now. • Jacob Shatzky, The History of the Jews in Warsaw I: From the Beginnings to the Uprising of 1831 (New York, 1947). • Jacob Shatzky, The History of the Jews in Warsaw II: From 1831 to the Uprising of 1863 (New York, 1948). • Jacob Shatzky, The History of the Jews in Warsaw III: From 1863 to 1896 (New York, 1953). • Malachi Beit-Arié, Unveiled Faces of Medieval Hebrew Books: The Evolution of Manuscript Production – Progression or Regression? (Jerusalem, 2003). • William G. Braude and Israel J. Kapstein (trans. ), Pesiqta de-Rab Kahana: R’ Kahana’s Compilation of Discourses for Sabbaths and Festal Days (London, 1975). Strack and Stemberger provide a variety of possible dates for this compilation, all of them within the first millennium but differing from one another by several centuries. A collection of homiletical discourses for Shabbatot and festivals, it has been described by some as the oldest exegetical midrash, and is our primary source for the ten special haftarot that are read before and after the 9th of Av. • Mordechai Z. Cohen, Three Approaches to Biblical Metaphor: From Abraham Ibn Ezra and Maimonides to David Kimhi (Leiden, 2008). In this text, Cohen applies metaphor theory to the figurative language found within Tanakh, and analyses the different ways in which these three rishonim interpreted scripture. • José Faur, The Horizontal Society: Understanding the Covenant and Alphabetic Judaism (2 vols; Boston, 2010). A somewhat strange but phenomenally eclectic collection of essays, dealing with a wide range of Jewish subjects and exhibiting an almost encyclopedic familiarity with the rabbinic literature. Its author is an alumnus of Beth Midrash Govoha in Lakewood, New Jersey, and a former professor at JTS and Bar-Ilan. • Martin Goodman, Rome and Jerusalem: The Clash of Ancient Civilizations (London, 2008). • Isaac Halevy-Levin (ed), The Revival of the Hebrew Language (Ariel 25; Jerusalem, 1969). Featuring articles by S.Y. Agnon, Chaim Rabin and E.Y. Kutscher, among others. • Leo Kadman, The Coins of the Jewish War of 66-73 CE (Corpus Nummorum Palaestinensium III; Jerusalem, 1960). • Gail Labovitz, Marriage and Metaphor (New York, 2013). As with the work by Mordechai Z. Cohen, mentioned above, this is a contribution to the field of metaphor theory, and one in which the author turns her attention to the language of commerce that pervades rabbinic matrimonial texts. • Binyamin Lau, The Sages III: The Galilean Period (trans. Ilana Kurshan; Jerusalem, 2013). 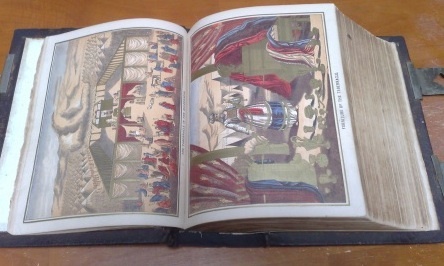 The third volume in a three-volume series, the first was titled “The Second Temple Period” (from Shimon haTzaddik to R’ Tzadok) and the second was titled “From Yavneh to the Bar Kokhba Revolt” (spanning Rabban Yohanan ben Zakkai to R’ Yehuda ben Bava, and the deaths of R’ Akiva’s students). This third volume, titled “The Galilean Period” covers the establishment of the bet midrash in Usha, through to the death of R’ Yehuda haNasi. • Marvin Lowenthal (trans. ), The Memoirs of Glückel of Hameln (New York, 1977). Written in Yiddish between 1690 and 1719, Glückel’s diary (which she authored for the benefit of her children, shortly after the death of their father) provides a fascinating insight into the life of a Jewish woman of business in the final quarter of the 17th century. 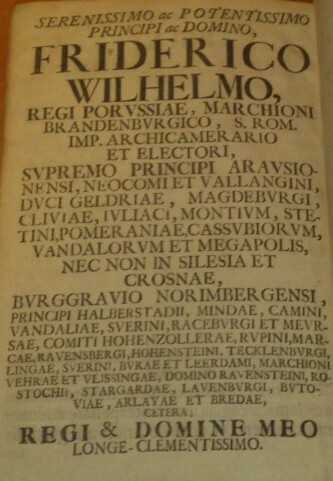 She writes of her memories of the expulsion of Jews from Hamburg in 1648, the Swedish invasion of Altona in 1657, the aftermath of the Chmielnicki uprising in the east, and the false messiah, Shabbetai Tvzi. The first of the two major German translations of this work was undertaken by a descendant of Glückel named Bertha Pappenheim. Better known to the world as “Anna O.” (the pseudonym by which Sigmund Freud and Josef Breuer referred to her in their case studies), Pappenheim was the most significant patient when it came to Breuer’s work on hysteria, and takes a major place in the early development of psychoanalysis. What can I say: this world can be a very strange place. • Shimon Yosef Meller, The Brisker Rav: The Life and Times of Maran HaGaon HaRav Yitzchok Ze’ev HaLevi Soloveitchik zt”l (3 vols; trans. Daniel Weiss; Jerusalem, 2007). Published by Feldheim, these three volumes constitute a (somewhat romantic) biography of one of the greatest Torah scholars of the twentieth century, the son of R’ Chaim Soloveitchik and the grandson of the Beis haLevi. His nephew, R’ Yosef Dov Soloveitchik (“the Rav”) is not mentioned once in the book’s 1,792 pages. His absence, while not particularly surprising, is somewhat striking in the opening chapters of the first volume, in which the Rav’s family tree stops with his father, R’ Moshe Soloveitchik (the Brisker Rav’s brother), and in which information about the life of R’ Moshe Soloveitchik is attributed to his grandson, R’ Moshe Meiselman. R’ Meiselman, who heads Yeshiva Toras Moshe in Jerusalem, has courted controversy with his pretence that the Rav’s Zionism was put on for the purposes of outreach only, and that the Rav (who was both his uncle and his teacher) was as staunchly anti-Zionist as the rest of the Soloveitchik family. • Jacob Neusner, A Life of Yohanan ben Zakkai Ca.1-80 CE (Leiden, 1970). • Jacob Neusner, Major Trends in Formative Judaism II: Texts, Contents, and Contexts (California, 1984). • Gil S. Perl, The Pillar of Volozhin: Rabbi Naftali Tzvi Yehuda Berlin and the World of Nineteenth-Century Lithuanian Torah Scholarship (Studies in Orthodox Judaism; Boston, 2012). • Aaron Rakeffet-Rothkoff, The Rav: The World of Rabbi Joseph B. Soloveitchik (2 vols; 1999). These two volumes constitute a brief biography of the Rav, followed by a compendium of remarks made by him on a wide variety of issues, translated into English. • William Shirer, The Rise and Fall of the Third Reich (1977). • Shaul Stampfer, Lithuanian Yeshivas of the Nineteenth Century: Creating a Tradition of Learning (The Littman Library of Jewish Civilization; trans. Lindsey Taylor-Guthartz; Portland, 2012). Shaul Stampfer focuses primarily on the yeshiva in Volozhin, which was established by R’ Chaim ben Yitzhak and which counted amongst its leaders (at least for a time) both the Beis haLevi and the Netziv, but he also gives attention to the yeshivas in Slobodka, Telz and Kovno. The yeshiva in Slobodka is particularly interesting to me: headed by R’ Nosson Tzvi Finkel (“the Alter of Slabodka”; 1849-1927), the yeshiva placed a very strong emphasis on the study of mussar. In 2011, when the rosh yeshiva of the Mir in Jerusalem died (a man also named Nosson Tzvi Finkel) he was eulogised by R’ Nissan Kaplan as having come to the yeshiva as a young American boy so many years back – a young boy, with no yichus. I don’t know what it means to have no yichus, given that his father was a rabbi, his great-uncle was the rosh yeshiva at the Mir, his grandfather was the mashgiach ruchani at Yeshivas Hebron, and his great-grandfather (for whom he was named) was the Alter of Slabodka. But there you go. • Reuven Ziegler, Majesty and Humility: The Thought of Rabbi Joseph B. Soloveitchik (Jerusalem, 2012). • Biblical Archaeology Today: Proceedings of the International Congress on Biblical Archaeology – Jerusalem, April 1984. This wonderful text contains articles and addresses by a number of different scholars, many of whom were giants in their field. The list of authors includes, but is not limited to, Frank Moore Cross, Benjamin Mazar, Yigael Yadin, David Noel Freedman, Norman K. Gottwald, Siegfried Herrmann, Moshe Kochavi, Amihai Mazar, Israel Finkelstein, Avraham Biran, Ruth Amiran, William G. Dever, David Ussishkin, Donald B. Redford, André Lemaire, Baruch A. Levine, Lawrence H. Schiffman, Joseph M. Baumgarten, Elisha Qimron, John Strugnell, Hartmut Stegemann, David Flusser, Cyrus H. Gordon and Ephraim E. Urbach.